Construction of the Mikhailovsky Castle was started by Paul I in 1796, almost immediately after the death of Catherine II. Paul I passionately wanted to move into your own castle from the Catherine Palace, where he imagined all sorts of conspiracies and where he could not feel safe. The most outstanding architects of the time – Viall, Bazhenov and Vincenzo Brenna had participated in projecting the castle. Fond of the culture of the Middle Ages, the romantic emperor approved the project, combining the features of a medieval knight’s castle and the secular European palace of 18 th century. Inclined to mysticism, Paul I hurried up with the construction. The work was unprecedented pace – around the clock, seven days a week. More than 6000 people in different specialties was occupied at the construction site. The majestic castle really seemed unassailable. The building was surrounded by water from all sides, and it was possible to get on it’s territory only through the drawbridge. 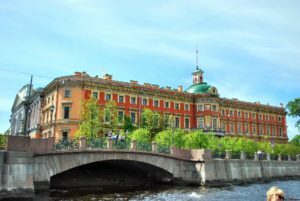 The palace’s splendid interiors, connected the residential function and a museum, where the Emperor of Russia ha? kept a rich art collection. The palace interiors are truly remarkable, especially the Throne and the Resurrection Halls, Antic Hall, Raphael Gallery, Arabesques gallery and St George’s Hall. But the impregnable castle served for the grand residence of it’s first owner, the most tragic the Russian emperor, just 40 days. On the night of 11 to 12 March 1801 Paul I was murdered by conspirators in his own bedroom. In 1991 the palace’s building was assigned to the Russian Museum. The castle and the surrounding areas had undergone a large-scale restoration works, and the ensemble had returned to its original appearance.